On an impulse, I picked up a bag of Stubbs 100% All-Natural Charcoal Briquettes at my local Lowe's the other day. I've used sauces from Stubb's and found them to be pretty good and I thought the charocal might be like the Kingsford Competition Briquettes that I've read so much about (but never seen in a store). So when I got home, I fired up the cooker with a small pile of the Stubbs briquettes and had the cooker going pretty quickly for some pineapple shrimp kabobs. My first reaction was that there's no difference in appearance or smell to any other briquette that I've used. And, given that I cook on Kamado style cookers the last thing I wanted was the extra ash that comes from briquettes vs. lump charcoal. In the end, the fire burned fine but didn't have the nice smell that I've come to expect from burning lump charcoal. It also created the ash that I had hoped to avoid and did not extinguish cleanly with the ability to relight again. 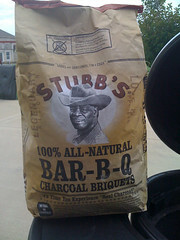 In short, this was just charcoal briquettes that I'd expected something more from because Stubb's had put their name on the bag. 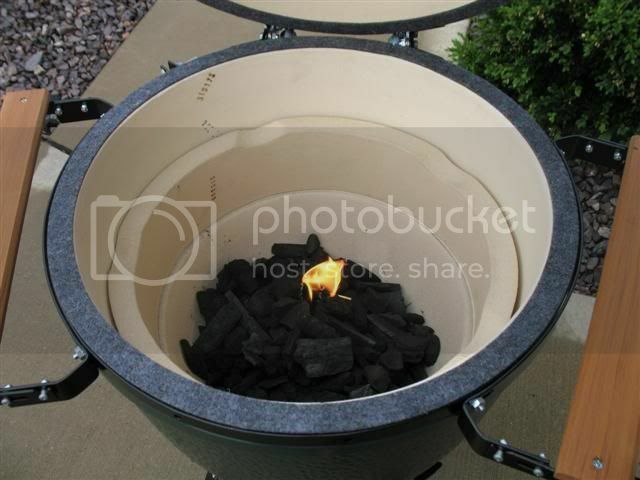 I don't know about you, but I'm sticking with all natural lump charcoal. Now I do a lot more lo 'n' slow than I do high temp grilling, but my daughter has been asking for steak so I obliged. And since the Bubba Keg is at its best at high temps, I fired it up Sunday night for steaks on the grill. I had picked up 4 filets at Sam's for ~$17. I raked the ashes out of the bottom of the BK and had it at 500 degrees in about 20 minutes with a fresh load of lump charcoal. The cast iron grate put really nice grill marks on the steaks and except for having to butterfly them (my wife and kids like their steak well-done), these came out perfect. They were juicy and fork tender. I heated this mixture in the microwave for about a minute to thin the olive oil and help to dissolve the salt. I wisked the mixture together and then poured it into a square baking dish. I then dipped each steak into the mixture, taking care to turn each one over to get good coverage. Then, I covered the dish with cling wrap and and let them marinate in the refrigerator for about 90 minutes. This simple marinade had a great flavor to compliment the steaks grilled over a hot charcoal fire. I see more steaks in my future!